After sewing a couple of pirate shirts for the kids during Kids Clothes Week I had some scraps left over from the yard I had originally purchased from The Fabric Fairy. It is such a great fabric I didn't want any of it to go to waste. I usually save solid color knit scraps for appliques, but with a print fabric like this one an applique wouldn't really work. I had some pretty good size pieces left, so I decided to make a colorblock shirt, pairing the print with coordinating solid fabrics. I started by modifying my pattern to divide the front into four sections. I used the cupcake top from Sewing Mama Rae Anna, but any t-shirt pattern would work for this. If your front shirt piece is a full size piece, start by folding it in half width-wise. If it is a piece that you cut on the fold then it is already folded in half for you! Next fold it in half length-wise. When I did this I made the bottom half a little longer to account for the hem. Put your pattern under a piece of tracing paper and trace the top half, adding a seam allowance at the center edge and bottom edge. Next trace the bottom half of the pattern, adding a seam allowance at the center and top edge. Do the same for the back pattern piece if you want to colorblock the back of the shirt as well. Use your new pattern pieces to cut out your fabric. Make sure that for each pattern piece you cut two pieces of fabric that are opposite of each other. For example, when cutting the top half of the shirt front you will want one piece with the neckline on the right side and the shoulder on the left side and one piece with the neckline on the left side and the shoulder on the right side. To do this flip the pattern piece over to cut the second piece. As you are cutting think about where the fabric will end up on the shirt - for example, I wanted the print fabric on the front of the shirt to be on the top left and bottom right. I did it the same way on the back so that when I matched front to back a solid piece would be sewn to a print piece at the shoulders, continuing the alternating pattern. Sew your four pieces together to make a complete front. I sewed the two top halves together first and then the two bottom halves. Iron the seams flat before sewing the top to the bottom, then iron again. From this point on you can proceed with your regular instructions for sewing your t-shirt together. I added interest to one of the solid pieces by adding an applique that mimicked a design from the print fabric. I cut out a red "X" and applied it to the white piece using Wonder Under, then used black embroidery floss to make a dashed line leading to the "X." I love the way this shirt turned out! It is so fun and I know the little guy is going to love wearing it whenever we get to t-shirt weather. I have a different version of a colorblock shirt in the works for the big kid, so when that is done I will have made four shirts out of my one yard of fabric! Great job it looks really good! This is such a great shirt! the 'x marks the spot' really makes it. 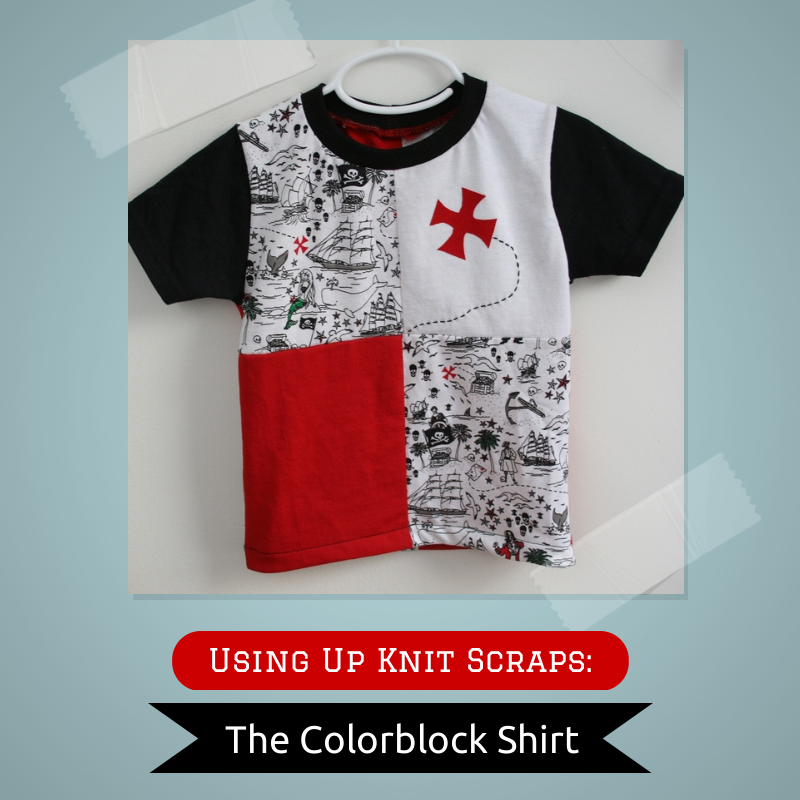 Thanks for linking up to Embellish is for BOYS!